Grocery counter LED Light Solutions - JK TOP-Industrial Co., Ltd. There are a few different filters for Grocery Counter Light Solutions that are central when it comes to meat and fish. High quality meat products are perfectly matched with light that has most of the radiation in the warmer red spectrum. This can be achieved by using special designed LED-modules. The result of the preferred solution is a vibrant red and fresh looking deli department. It is not only about a commercial lighting design, but there are also many functional aspects. Saefood like Salmon and shrimps are typical foods that should be combined with a warmer LED light source. It will attract customers by enhancing the red and pinkish colours of the seafood. The difference in colour temperature does not “kill” each other since warm LED and cool colour contrasts like Blue enhance each other. The fish counter is an area where you usually experience a cool feeling as the fresh goods have to be kept cool. 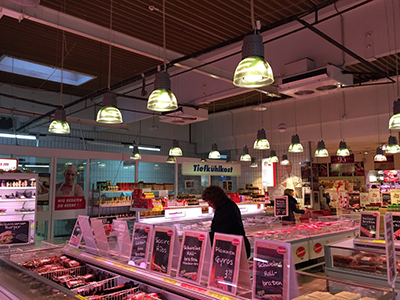 Pink ore White LED with 2700K and a high CRI above 90 Ra protect the bloom, the natural juices and flavor of assorted meat products ensuring shoppers are more satisfied with their purchase. Fruits and vegetables look can be achieved by using a LED light Solutions source with 2700K warm white and a color rendering index ( CRI ) of above 90 Ra or alternativ pink LED. The warm colours in bread and cheese are enhanced by using 2700K LED or below , due to the high amount of warm wavelengths in the spectral distribution.